While our feline friends may always look and feel sprightly to us, it surprises many cat parents to learn that once a cat reaches the age of 7, he or she is considered a senior. Thanks to advances in veterinary medicine and preventive health care, our beloved kitties are living longer. In fact, most cats spend the majority of their lifespan as seniors! 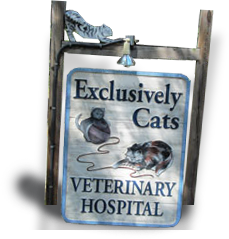 At Exclusively Cats, we understand the special needs of older cats. Many of our most cherished patients are geriatric cats, and we have become skilled in managing conditions related to age. Since we treat felines exclusively, we are adept at recognizing both the diseases and disorders that could potentially affect your cat’s health as he or she ages. We know which physical and behavioral changes to look for and how to treat the underlying disease process. And, as is always the case, we cater our approach based on the varying temperaments and moods of our feline patient. It is important that all senior cats have regular check-ups so that any health problems can be detected and treated early, before they become serious. Even the most conscientious of cat parents are not trained to recognize the sometimes subtle cues that their feline buddy is not feeling his or her best. For example, it isn’t easy to notice mild weight loss (often a sign of illness) in a cat, especially a fluffy one! How many cat parents routinely weight their cat? In the case of seniors, it is not uncommon for a cat to have more than one disease process occurring at the same time, which further complicates detection. Because one year in an older cat’s life is equal to roughly five years in a human's, we recommend that our older patients come in at least twice a year for a physical exam, weight check, and thorough discussion of “how your cat is doing at home.” We also use this opportunity to discuss needed diet changes as your cat ages and to teach you what signs to look for that would suggest a need to bring your cat in sooner. We strongly suggest that all senior cats receive an annual comprehensive blood profile including CBC, blood chemistries, urinalysis, and thyroid values, in order to look for early signs of common senior cat health issues. If a problem is found, we will discuss with you treatments to manage the problem and set up a monitoring schedule. If your cat is showing signs of illness, but the most common problems have been ruled out, we’ll keep looking for the problem until we find out what needs to be done to enable your cat to live her “senior years” in comfort and happiness. Feline hyperthyroidism is caused by an overabundance of thyroid hormones due to the development of a benign tumor of the thyroid gland. The excess hormone causes a “speeding up” of your cat’s metabolism, which in the early phases looks like “great appetite with some weight loss,” but in the later phases it can be deadly. If caught early, though, it can be successfully managed with an oral or “rub on the ear” medication or it can usually be cured with an injection of radioactive iodine. 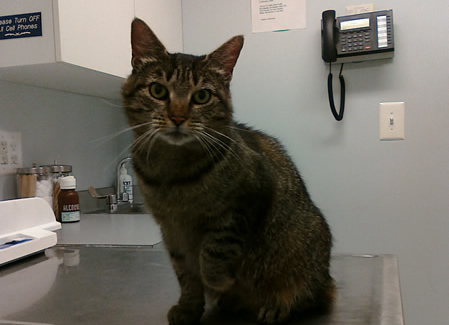 Both treatment paths give your cat a very favorable prognosis for a happy life. Early phases of this disease result in no real “illness” to your cat. Sadly, later stages can lead to severe kidney failure and eventual death. Fortunately, by early detection, and then by dietary management and medical therapy, the progression of this disease can be slowed down to many years of a comfortable life. But early detection and management is essential. Although the symptoms (increased thirst and urination, usually with weight loss and appetite change) are the same, the cause of and management of diabetes in cats is quite different than it is in other species. In cats, various factors prevent the insulin from functioning normally, leading to a high blood glucose and (if not detected early enough) secondary kidney, liver, and/or neurological disease. Fortunately, properly managed diabetic cats live long happy lives, with some doing so well that their insulin injections can be stopped. This condition is due to the small and/or large intestine becoming inflamed for various reasons, resulting in poor absorption of nutrients and poor processing of the food and/or stool. Symptoms vary, but weight loss, “stinky stools,” chronic vomiting, and/or chronic diarrhea are among the most common ones. Feline arthritis is a degenerative condition that damages the cartilage and bone of the joints, causing decreased mobility and chronic pain for the cat. Since cats hide their pain well, the only symptoms may be hesitant or slower jumping, night crying, or not using the litter box. Fortunately, there are “kitty safe” ways to lessen your cat’s arthritic pain. Cognitive dysfunction, Feline dementia is a condition that resembles human Alzheimer’s disease. Signs include wandering, excessive sleeping, confusion, indifference to food and water, urinating and defecating outside the litter box, andincreased vocalization, among other symptoms. Fortunately for both you and your cat, recent research has shown us ways to both manage and lessen the chances of your cat developing this condition. These are just a few of the many conditions feline patients may develop as they age. By working with a cats-only practice such as ours, you will benefit from specialized knowledge and our experience managing geriatric feline conditions. Read more about the special needs of senior cats from Cornell Feline Health Center. We want you to cherish your cat’s senior years! Contact us today to learn how to best care for your beloved senior feline companion.